Who doesn't love to travel? I've done my fair share (with more around the corner) and I thought it'd be fun to create a guide for the traveler in your life. 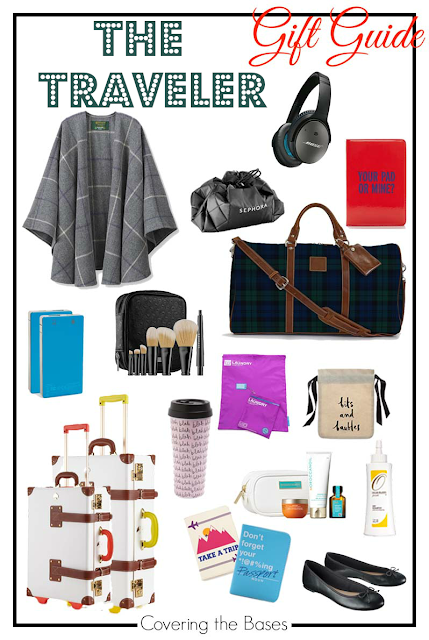 Above are some of my must-haves when traveling like my dry shampoo, comfortable flats and noise-canceling headphones. The key is to have all your bases covered (see what I did there?) and think of anything that could go wrong! You need to be prepared for whatever traveling can throw at you and you have to look good doing it. So why not travel in style? Any of these gifts above would make wonderful presents for your loved ones near or far. Maybe if you get them travel themed presents that will cause a spontaneous trip! I love that duffel bag and cape! Too cute! Agreed - the duffel bag is adorable! And not as expensive as I was expecting! Love the classic black flats too for only $20!